Back-to-school. It’s a term you either love or hate but either way it’s coming quickly. I’ve completed my back-to-school shopping early this year and wanted to share with you the best of what I found. I’m not just telling you about it but giving you the chance to win a backpack FULL of all my favourite things in my BIG back-to-school giveaway with prizes valued at over $500. A few weeks ago, the kids and I headed to Ottawa. Next to our hotel was a great Chapters. It was then I noticed how awesome their back-to-school gear was. I decided to seize the day and grabbed some amazing stuff. You can see the entire back-to-school collection here. I’m a huge fan of cute backpacks and fell hard for the Parkland Bayside Packpacks available from Chapters Indigo. Charlie loved the mint colour (Jawbreaker) and Will immediately picked out the camo bag (Geo Camo). My kids aren’t lugging too much back and forth yet so these bags are a perfect size especially since we walk to school. The large mesh pocket on the side is a major plus for storing water bottles and Will’s favourite school necessity, his handball. 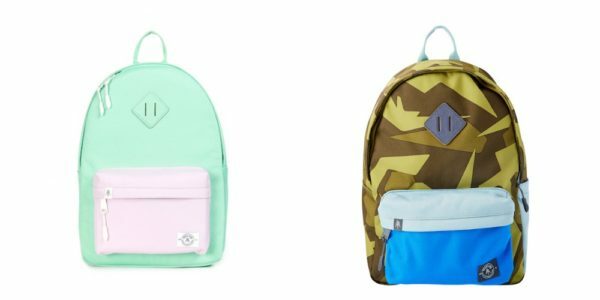 Win my BIG back-to-school giveaway and you’ll score two Parkland Bayside Backpacks; one in Jawbreaker and one in Geo Camo (exclusive to Indigo)! Value: $39.95 each. Bento boxes are all the rage for school lunches and there’s no doubting why. They are perfect for sending small portions of your kids’ favourite foods to school. I couldn’t help but smile checking out the brightly coloured Monbento Tresor boxes and imagining what food I could pack up in them. Each box includes a bottom container (450 ml) and two food cups (150 ml each) that are microwave-safe and airtight, BPA-Free, food grade materials, Freezer safe and Dishwasher safe. 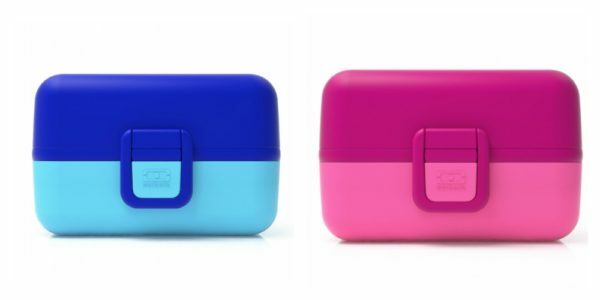 My BIG back-to-school giveaway includes two Monbento Tresor boxes in Blueberry and Raspberry! Value: $29.95 each. As a mom, I know I can never have enough bento boxes, or big enough ones. I love the Monbento Square Bento Box for days your kids simply need more food. It has two airtight containers, one inner food container to separate parts of their meal and one large and one small elastic band so you can use it as a one-level or two-level bento box. Made from high-quality food-grade plastic with a “soft-touch” finish, it’s 100% airtight and fully microwavable (thanks to small silicone caps in the intermediary lids). 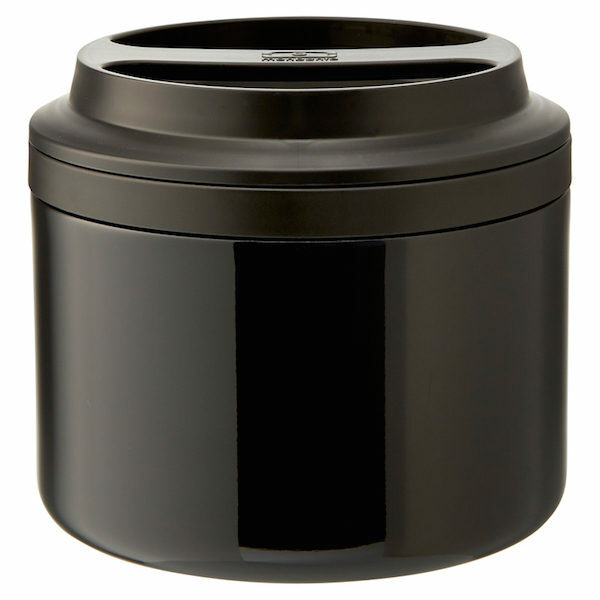 It’s also BPA-free, microwave and dishwasher safe and freezer-safe. Score. This bento box changes to accommodate whatever snack your kids come up with. The inner partition moves for equal size snacks on each size or something more like carrots and dip. It stays shut with a secure band that wraps around the outside. Also BPA-free, lead-free, microwave and dishwasher safe! The final lunchbox staple that I love is the Monbento Element Insulated Bento Box. Perfect for pastas, soups, chili and more. This additional to your school lunch arsenal will help you defeat the “I don’t want another sandwich” days. The Monbento Element insulated bento box keeps your meals warm or cold for up to 5 hours and is food grade, BPA free, insulated and dishwasher safe. 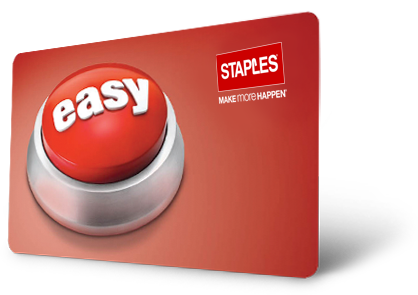 Known for having the best back-to-school ads ever, Staples is well– a staple in my shopping. I love the store layout and they really do have everything you need to get your kids ready for to head back to school. This year, my favourite find for the kids was a series of Emoticon magnets and Emoji pencils and erasers. Will and Charlie loved picking all their favourites and I think they will be a huge hit at school. A long long time ago, my backpack for school was constantly filled with Mr. Sketch markers. I’m glad my kids share this fascination. Mr. Sketch has come out with some incredibly cool stuff for the upcoming school year. Forget your kids, when you see these crayons you are going to want to keep them for yourself. They look sort of like lip gloss and smell amazing. They are so much fun to colour with I’ve confiscated the pack I got for the kids to up my colouring game. Summer is ending but that doesn’t mean all things ice cream need to go away. These markers are cute as can be and will keep your kids daydreaming of summer straight through the school year. Scents include Bubble Gum, Chocolate, Mint Chocolate Chip, Lemon Ice, Strawberry and Stinky Cheese. The Movie Night markers were a huge hit with my son Will and I’m sure your kids will love them too. Scents include Yellow Hot Buttery Popcorn, Pink Watermelon Hard Candy, Light Blue Blue Raspberry Slushier, Orange Nacho Cheese, Dark Brown Mint Chocolate Candy, and Light Brown Root Beer. I’ll admit it, I first bought these crayons because I thought the fact they twisted was cool. I was right. Now when the kids manage to break a small piece off or wear the top off, they simply twist the crayon up to continue drawing. Problem solved. These are my go-to for school because my kids’ uniforms are white. Charlie has sufficiently tested the “washable” claim and the scent adds an extra layer of fun to craft time. When I spotted this set of inkjoy gel pens, I knew I needed it for myself. Although the kids each got a few, this rainbow of gel pens now sits on my desk. You should see how good my calendar looks. Well.ca has become one of my online go-tos for school shopping and more especially since shipping is free on orders over $29 (before taxes and shipping). Here are some of our can’t live without ’em products found on the site. In my humble opinion, S’well water bottles are nearly impossible to beat in quality. I love them because there are no tiny parts to clean or even worse lose; they keep drinks cold for a full 24 hours and hot for 12 and they are most importantly non-toxic, non-leaching and BPA Free. Charlie picked out this dark hearted bottle while I ordered a few extras in fluorescent pink so I don’t have to hear “Where’s my water bottle?” every morning at 7 am. As some of you know, Charlie has some pretty severe allergies which means we bring snacks and lunch everywhere we go. I started using the Fluf Meow Snack Packs and love them. They are fully machine washable and have a water resistance lining. They are also made with 100% certified organic cotton and a tested food sale lining free of BPA, phthalates and lead. Charlie doesn’t mind bringing them along because she loves the cute designs. I found Made Good Bars halfway through the school year last year and they were a lifesaver. My kids love all the flavours and I feel good about giving them Made Good Bars for snack time. The best part is Made Good bars and granola minis are free from and made in a facility free from the 8 common allergens: Peanut, Tree Nut, Wheat, Dairy, Egg, Soy, Sesame and Fish. Meaning they are safe not only for my Charlie but the kids in both their classes. We are currently on a road trip and as I watched my kids devour Hungry Buddha Coconut Chips in the car yesterday, I couldn’t believe I forgot to add them into this list! The coconut chips are sweet enough to taste like a treat while being dairy-free, gluten-free and non-GMO. Now the Canadian company has announced that they are releasing snack packs designed for kids on the go. The snack packs come in four amazing flavours: Classic Coconut, Smokin’ Sriracha, Cheeky Chocolate and Heavenly Honey. Win my BIG back-to-school giveaway and you’ll win a selection of full size Hungry Buddha Coconut Chips! The return of school means the return of head lice. The good news is you can be prepared before they strike with the Lice Squad Louse Trap Comb. I picked one up after a family of lice found a comfy place to live in my kids’ hair and haven’t had a problem since. If lice do decide to visit your home, I strongly advise you call the Lice Squad. They are my source for panic and tear free lice removal in our home is 2012. The last thing on my list is the one I always order first when it comes to back-to-school shopping; Mabels Labels. These labels literally survive anything my kids do to them and make it so their belongings remain their belongings. This year, I picked up the Ultimate Back-to-School combo for both of my kids. The combo includes 40 Mini Custom Name Stickers; 50 Tag Mates™ Stick On Clothing Labels; 16 Custom Shoe Stickers; and 2 Personalized Mini Tags. Last year, this amount of labels got us through school and 6 after-school activities without a single ballet shoe or karate belt being lost. I am a teacher and a mom. We would love to win this! Thank you! Thank you for the chance to win such an astounding prize package!! All the necesessities for b2s! Wow such an amazing contest, good luck everyone! Thanks for the giveaway! My kids could really use this!! Mr. 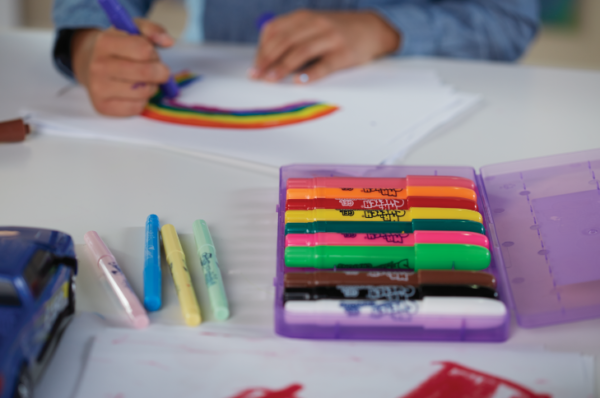 Sketch Scented Washable Markers are a staple in our home and for back to school! My children get a new pack every year when we go back to school shopping! What an amazing prize package, thanks for the chance to win. Would definitely help out my nieces & nephews to win this. What an awesome epic giveaway that would absolutely ease our stress for back to school! All really great products. Would be so perfect for back to school! Thank you! What a fun contest! My kids would love EVERYTHING. I have not even started my back to school shopping yet. Thanks for such an awesome giveaway. Awesome contest! This would really help with back to school costs. What a lot of goodies. Thank you for this chance to win these things. This is an awesome giveaway. My kids would put good use to these supplies. Back to school means back to the kindergarten classroom for me. I would love to try your favourites. Back to school can be such a stressful time. Staples has always been a favourite place to shop for school supplies. Thanks! Thank you so much for the chance to win! This is one wicked awesome prize package! Generous contest Sarah, love school supplies ? Wow! What a great prize pack! Lots of great products for back to school. I could use some luck. Have to sell my house baby due in November and moving to a new build in December then of course Christmas. Agh stressful. Plus back to school. This is a great giveaway – so many of my favourite brands! Thanks for the chance. Thanks for the chance. Need to pick up a few more school supplies. Wow what an assortment of products! I especially love that they’re your favorites. It’s one reason I read your blog, it saves me time and money learning from your experiences. Thank you. Best wishes! My mother is a kindergarten teacher and I’m a college student, between us we’d make use of everything! Great product reviews and of course great giveaway! What a great prize for back to school. This would be great for back to school. Thanks for the chance. awesome! so perfect for back to school! wow all i can say is best giveaway ever . When you have more then one child going to school its challenging to get everything they need . soooo thank you for this chance ..
Well.ca has the best customer service I have ever experienced! Thanks for the amazing giveaway. Back to school is so expensive with three kids!! Great giveaway! This would really help cut down the expense of school supplies. What a great prize pack! Thanks! Thank you very much for the chance to win this awesome prize! Wow this is amazing! I was actually looking at these Bento boxes at Chapters yesterday and thinking how perfect they are (although out of my budget at the moment). Thanks so much for the opportunity to win this amazing prize pack for my kids! Awesome! Would make back to school less stressful! Great stuff for the kids to go back to school with. Thank you for the amazing giveaway! The perfect back too school prize pack! This would sure come in handy! Thanks for the chance! Such a wonderful giveaway. Thank you for the offer. I don’t shop well.ca often, but I do hit the site about 2-3 times per year. Thanks very much for hosting this. my daughter is starting KG this year and it’s my sons last year of Elementary school …thanks for the chance to win! amazing prize!! What a perfect back to school prize pack! Very nice1 Thanks for the chance! Love the backpacks! Some great products in this giveaway, perfect for back to school. Hard to believe it is that time of year to start thinking about that again. I have had my eye on those PAPER MATE INKJOY GEL PENS for awhile now….thought they would be a cool gift for my granddaughter for her birthday!! the whole back to school prize pack is loaded with fun and useful things the whole family will love!! There is all cool stuff here! This is an awesome giveaway. Love the look of the Bento Boxes. 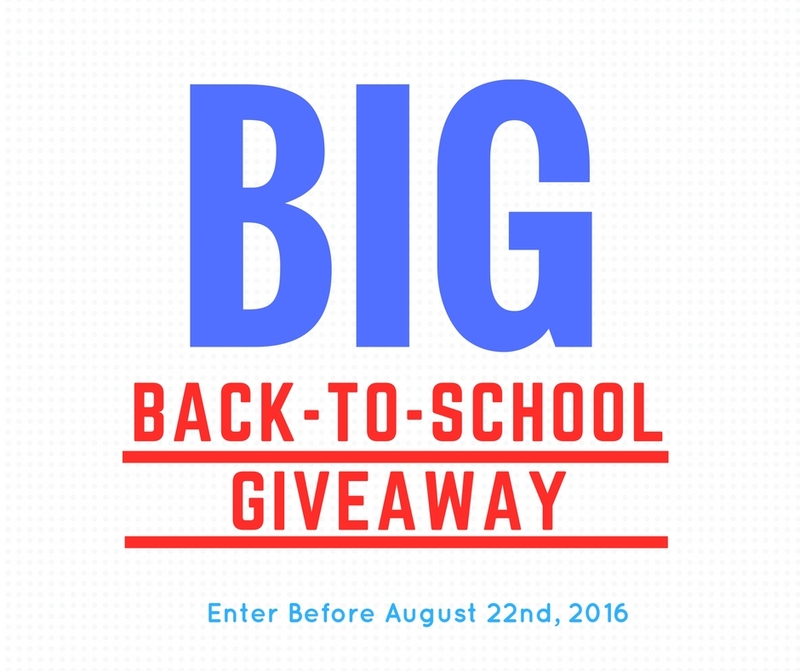 Great giveaway – thanks for the chance to win some amazing back-to-school supplies! Prizes like this make back to school time so much fun! My nieces and nephews could use this! Love the useful and unique prizes. Great ideas for back to school. This is an awesome prize pack to help families get their kids ready for school.. Thanks for the chance. Great for my grandson! Thank you so much for this awesome giveaway, so many great products!! Thanks This would sure help us out. My daughter’s going into first grade this year! What a generous back to school giveaway and would enjoy sharing it with my grandchildren. Thank you for such a wonderful and useful giveaway! My niece would love this for her children. She’s struggling financially and could use all of these. Awesome contest. Hope I win. I love those labels! All this stuff is pretty awesome thank you! Good luck everyone. What a great contest. The grandkids could use this to go back to school. My grandson would love to have these items to go back to school. so cool! these labels would be great for school! This is an awesome prize that would be super Helpful! This would be perfect for BTS! Any school supplies would be awesome and such a huge help! Thanks for the chance. This is a great giveaway! this is a fantastic and useful prize pack! Staples is definitely a must stop when I shop for back to school. Back to school time is always a stressful time when shopping for supplies. Winning and getting school items for free would be a relief. This is just so amazing, and would be an incredible blessing for whoever wins. Thanks again for the chance! Such great prizes. I would love the MR. SKETCH SCENTED WASHABLE MARKERS! I’ve been looking at the Parkland backpacks on chapters.ca for my kids — we love them! Being a “Solo Mom” myself, this would really help out. Thanks for the chance! My siblings and I could easily split this between us for a great academic year! As a university student I would love to win this! Great set of items; perfect for school, art and creativity or just to waste some time! I work and volunteer with refugee kids on the weekends and this would be a perfect enhancement to the supplies I use for their lessons. Thanks! Thanks for the opportunity to win this amazing prize. Thanks you for the contest. My daughter is a teacher and a lot of this she could use in her classroom , especially for the kids who don’t have much. Hey Sarah. All of this back-to-school stuff looks fantastic! I love the electronic product suggestions! Wow, thank you for this amazing giveaway! Love Mabel’s Labels, they are great! OMG! Looking at these school supplies make me excited for school! I’m starting college soon and that back pack is great for carrying my books and laptop! Good Luck to everyone! Thanks for the great giveaway. I would love to win this for my daughter. Wow what a great prize package! We have four going to school, and this would all really help – thanks! Thank you so much for this awesome giveaway with so many great products! These are great ideas to help with back to school. Great giveaway – would love to win! Thanks for hosting this amazing giveaway, great prize to help get ready for back to school. Amazing goodies for the kids. There’s awesome and then there’s awesome! Very exciting! My girls start school this year! They would love this! WOW, prize perfect for my niece’s big BDay gift. . Thank you for the awesomeness, the contest, and generosity. 🙂 Pick me. Fingers crossed! Love you blog! Nice selection for the giveaway. What a great giveaway! I love that the PAPER MATE INKJOY GEL PENS IN 14 COLOURS were included in your giveaway! They’re pretty and practical! Happy back to school! Thank u for the great contest. I really want a Bento box, it would be perfect for my daughter! This would be so perfect! The Bento Box would be great for my son to take his lunches to school. I would love to try a Bento Box. Great selection of products that are so useful! so many useful products in this giveaway! great giveaway – thank you for the chance to win! Hard to believe it is almost back to school time, great prize for it 🙂 Thanks for the chance! This would be an amazing way to start off the school year! i love back to school prize packs! I love the bento boxes! BPA-free, lead-free and dishwasher safe — sold! This is too good to be true! What an amazing winfall! Those Skip-Hop backpacks are the cutest! My grandkids would be so happy if I won this for their back to school fun in September. The Bento boxes are such a great idea for lunches. Awesome assortment of great items! Loves the markers when I was a kid! What an amazing giveaway! I love the Bento boxes! Would love to try these Made Good snacks! Cool blog you have! This is perfect since school had just begun yesterday. Thank you for this and it is really informative. Summer seemed to fly right by! Hard to believe it is back to school time already. We are excited for my daughter to start kindergarten this year. 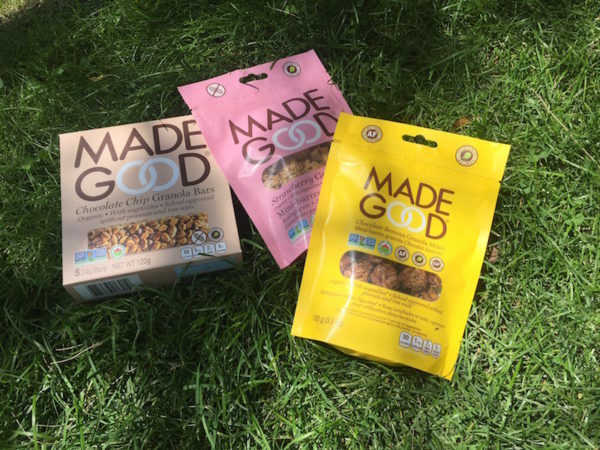 I would love to try the Made Good products – they look very delicious. I love these ideas for back to school items! Thank you for the awesome back to school giveaway.Staples has always been afantastic place to shop for school supplies that the kids need and for office supplies for us. Such great ideas for back to school. Thanks for giving us ideas! I love InkJoy pens but I never used them because they were ugly, the new design is fantastic! Thanks for the giveaway! All very useful. What an awesomely generous give away! I’m just about to start BTS shopping ans Staples will be my first stop! What an amazing prize! I’m sure Miss R would love it all. Thank you. I really love the assortment of Bento Boxes. I would love to win! Mabels Labels would be perfect for my grandkids supplies and clothing for back to school. This would be amazing! I love the bento boxes…genius! I would love to win the great prize so I can give it to my niece to have when school starts! Love the prize pack. Would love to win for the grandchildren. Awesome contest. Thanks for the chance to win! Would love to try these bento boxes! I like the Bento boxes! Really, how can you do this? School supplies are expensive, let’s face it. Thanks! Hope I win!! Wow, what an amazing prize package!! It’s exactly what my grandson needs for back-to-school, thanks very much for this ahhhhh-some contest! I have been checking out Staples Back To School Centre. Lots of great items and good prices too! These items would help start the new school year off well! That blank bento box looks so cool and useful! Amazing giveaway, thanks so much for the chance! Lovely back to school prize. What a wonderful selection of BTS items! This prize would certainly help my daughter with some needed supplies for her class. I would love to win this prize pack and make two incredible backpacks of school supplies to donate to two deserving students whose parents otherwise wouldn’t afford much. Thank you for the amazing giveaway! I love Mabel’s Labels! This is a great list of products! perfect giveaway! Thanks for the chance! Zomg this would save my life. In the middle of moving, every expensive. My son and daughter would benefit! Would love this for my grandson. The family has limited income so having these supplies for school would be really helpful for them. The could probably apply for assistance but choose not to and go solo to support the family so would be so nice for me to win and present it to them. This would help so much..back to school is stressful when youre a single mom to 4 kids! With 3 kids returning to school, this prize pack would come in handy. The Parkland Bayside Backpacks one in Jawbreaker and one in Geo Camo would be perfect for my grandkids to carry to school. This is such a great giveaway! Thanks! Chapters Indigo always has fun and useful items for Back To School! What a great set of products! I love the beautiful colours of the inkjoy pens and the bento box looks like it will make packing lunch easier (and less wasteful which is a big deal around here! No more plastic baggies). This would be so helpful, nice prize! My girls would love the Bento boxes. thanks for the chance – this would be super helpful this September! SoloMom you are my super hero! Would definitely help with Back to School Shopping, thanks so much for the amazing giveaway! What an awesome back to school prize pack! My son adores Mr Stetch markers but I haven’t seen those gel crayons, so cool. We’d be pretty much all set! Such an awesome giveaway! Would definitely love to win this! Amazing giveaway! My kids and I would love all these things! What an amazing giveaway! Thanks for the opportunity! Thanks! Would love to have these amazing back to school items! Would LOVE this! I am sending my son and my niece both start school together this fall, winning this would give my sister and I some financial relief this school year. This would be amazing! My kids would be so excited and my pockets would be too! Love each of the prizes! What an amazing contest! Great contest…..Thank you my daughter will love it if we win. Great prize , thanks for the chance to win. Thanks for a great prize! Great boost for back to school shopping. Wow! Amazing giveaway! I’ve been wanting to try a bento box for my girls so the fact that there are some in the prize pack is perfect! Wow lots of great items. I’m going back to school in September. I would love to win this. It would help so much :). Winning this could almost make going back to school fun! This giveaway makes me want to pull up a desk and go back to school! BTS supply lists just seem to get longer and longer annually. Not to mention the hike in School Fees ! Prize of this nature is huge to a Mom with kids entering Grade 8. Thanks for the chance. What a wonderful giveaway! Thanks for the chance! Fantastic head start to the year. Thanks to Sarah and Chapters for the chance! I am a single mom and have 4 teenagers to buy stuff for school so this is an awesome giveaway!! I really hope I win because I could really use the help this year! Just in time giveaway for making back to school more enjoyable. Love everything on this list!! As a mom of three this would be an amazing prize to win for my kids for school!! Wow!This is so great – I’m excited to check out some of your recommendations!! My son is starting school in September. Thank you for this opportunity. One less thing to worry about would be great. J’aimerais tellement gagner!!! Je tente ma chance!!! This would be so helpful, with 4 kids BTS shopping is so expensive, thanks for the chance and good luck to all! The Bento box looks amazing. Everything on the list here would be awesome. This would be great for back to school! OMGoodness! Such a generous prize, so needed by everyone also. Such a great collection! We love Mabels Labels! Everything gets labelled! I’ve never heard of that line of Bento boxes, will have to check them out! I promise to pay-it-forward; there’s so much to share! Whay a fantastic giveaway!! Thanks for putting this together!!! This would be awesome for my grandkids! My grandchildren would love the gel crayons. OH BOY! This reminds me that I need to start my back to school shopping already. Love the items you showcased! Wow, what a huge giveaway. It all looks amazing. What a great prize pack. Many items that I would highly recommend as well as a teacher and a mom. Would love this for my girls! All these would be well used! Thank you, so many things to get ready! love back to school shopping time! I like to also pick up things for the home to use through the year..papers, pens ect..
we love Mr. Sketch! so fun to draw with them. My fingers are crossed!! With both kids in school this year there’s more supplies to purchase! Very useful prize package! Thanks so much for the chance! Awesome collection!! Thanks for the contest. What a great variety of products!! What an amazing contest, would love to win! Thanks! Great prizes would love this. I work with kids with Autism and we always needs more supplies. Thanks for the giveaway! My grandkids could really use this! Looks like a great giveaway! Thanks for this opportunity! Love it! Some awesome stuff here! I think any kid would love to have these items for back to school. Wow, such an amazing contest with a great variety of products! Thanks for the chance to try some of the items you love. Hugs and Good luck to everyone! This is an amazing prize to win and love the products that are available. Thanks for a chance to win it. This would be perfect for my niece, as she is responsible for her own school supplies this year and is finding it hard. I really like that the prize includes a gift card to well.ca. I love shopping there. Love the bento boxes! thanks for this amazing giveaway! Living paycheck to paycheck and this would really help out! What a collection of handy products…and some I have never heard of before. Thanks for the great ideas! Wow! A lot of really great things! My kids would love this! And this Mom would love it for them 🙂 Thanks for this great contest! Would love to share this with my two nephews going to school in the fall. The youngest is going for the first time and is beyond excited! What a fantastic prize! Would love to win. My eldest is starting grade 1 and this would be great in getting him ready! This would be great o get a jump on back to school shopping. I know my kids would love all of these products! This prize pack would help with getting ready for the school year. Omgoodness with all the strains of this year, this would be an amazing help! I love this contest! My two kids would dig those back packs and those scented markers so much!!! (and mom would probably colour with them as well…let’s be perfectly honest here). Oh my!! so exciting with so many amazing things for Back to School!! Thanks for the great giveaway!! I love the colours the Takenaka bento box comes in! It is just so pretty and useful! Would totally love to win this! My kids love to browse in Chapters. We find lots of fun back to school items. Thanks for a chance to win some back to school items! Great prizes! I would love to win! Great back to school prizes. Would love to win. wow!!! 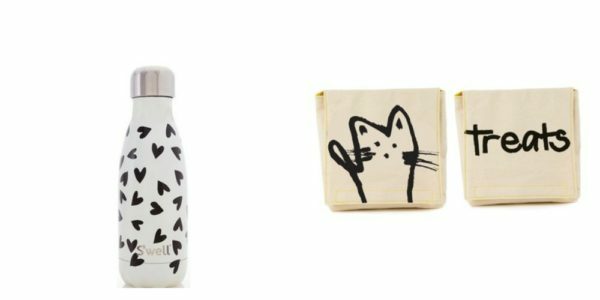 Great intro to a few brands I’d not heard of, and definitely some of my fav items/shops included 🙂 We just love Well.ca! Thanks for the chance to win! Such a great giveaway, thank you so very much!! Wow! What an awesome giveaway! This would be a lifesaver for me with 2 littles going back to school. Amazing! I would love to win! This would be an absolute life saver! My kids would be so happy? Would definitely be a helpful giveaway to win, thanks for the chance! Amazing giveaway!!! This would be such a great help!! Thank you so much for the chance. Staples and I have a love /hate relationship at this time of year…..but I just can’t stay away! Those Made Well Bars would be a healthy snack. I love shopping on Well.ca! Thanks for the great giveaway! This is such an awesome Giveaway!! My favorite time of year is back to school shopping. I love the smell of new pencil crayons and binders!! Even more fun is using last years old crayons to make crafts!! I have four kids going back to school in the fall! These supplies would be a big help! oh my goodness, what an awesome/great giveaway; I have never seen so much in one giveaway. These are all great, I especially love the Made Good bars. This is an amazing giveaway, thank you so much for the chance to win!! My grandkids would really like the Made Good bars and granola minis. Wow this is a fantastic giveaway. With 2 kids going back to school this would be great. What a great selection! Thanks for the giveaway! this would be awesome to win – cool stuff!! Nice selection. Lots of variety and practicality! Wow what an awesome giveaway! This will really help the winner with their back to school shopping. Thanks so much ? Wow, I have 3 little boys and this would be incredible to win for their first days of school. Thank you for the chance !! I’m not a mom but I am a very involved aunt! !! Would love to surprise the little ones with this great package. Wowzers! Love to win it ALL! What awesome products these are! This prize would help my daughter so much. This would help with my daughter, and nieces and nephews as well. 🙂 Thanks for giving! I am so thankful for durable labels! Replacing lost gear isn’t cheap!! Fantastic prize pack,so great for back to school. have always wanted to try a s’well bottle! this would be awesome for my two kiddos! Sounds like an awesome give-a-way package. I love these picks for back to school. Thanks for a great contest. Thanks so much, would be a great way to help my nieces/nephews out with back to school. I get so excited everytime I see this giveaway!! So awesome! Thank you!! Thanks for the chance to win this amazing prize! The products would be very useful. My daughter loves Mr Sketch markers! Any of these things would be one more thing to check off my list. The Mr. Sketch gel crayons are such a great idea. What an amazing giveaway. Whoever wins this is lucky indeed. Love the chance to win. The bento box looks great! I didn’t realize that Chapters Indigo carried so many back to school items – never really thought to look there until now! I have lots of grandchildren who could really use these school supplies! What a nice back to school prize pack. Some I have heard of and used and others are new to me. Thanks for the chance to win them. This is such an amazing giveaway, thank you so much for the chance!! Thanks so much for the chance! Great round up of back to school goodies!! Would love to win this… I love all those products. Thank you for the chance ? could really use the help this would give us! This is am amazing giveaway! Thanks! Awesome prize pack! Would love this for my new kindergarten boy! Very nice! I love Indigo! Thanks for this incredible offer! This would be an awesome prize for my daughter! Made Good snacks are so delish! Looks like an amazing prize, thanks so much for the chance & thank you to all the sponsers! Would be so perfect for back to school! Thank you! Love these ideas for back to school. A great way to send the kids back. What a wonderful selection of items! Thanks for the chance to win! Great selection of items. Love to win. Wow! What an incredible giveaway! This would awesome for back to school for my daughter!! good luck everyone. Amazing contest with great prizes. really great items in here – thx. I love these items, great list! The Made Good bars sound delicious and healthy for the kids. My girls would love to go through this prize pack with me!! Picking out their favourites! Every year school shopping seens to get more expensive, I dread it because I am single parent buying for 4 teenagers! The Geo Camo Parkland Bayside Backpack is adorable! Thanks so much for the chance! Looks great! Would love to win this prize package! What a great contest! Thanks for the opportunity! This is an awesome prize pack! My daughter would the square Bento Box. Love to win all these great back to school goodies! Great giveaway for back to school. I love putting labels on all my daughter’s items. Great to have if they ever get misplaced…even at a playdate. Please pick me! 🙂 We could really use these fabulous back-to-school items! My daughter would be so happy if I wonthis for my grandson. Sketch markers are always fun. Would be perfect for Back to School, thanks for the chance to win! Lots of awesome ideas. Thanks. Chapters Indigo has a super selection of school supplies! Wow! I love these products. Thanks for the great back to school product ideas. I loved scented markers when I was a kid! The Mr. Sketch scented markers and crayons are always fun for kids. Thanks for the giveaway! The Lice Squad products are amazing!! unfortunately we had to battle this yucky bug a few years ago and a friend suggested Lice Squad and it got rid of the pests!! This is just so amazing. I would love to try these Made Good Bars! I would love to win this nice prize so that I can present it to my grandchild. Back to school is coming soon. Love it all!!! Thanks for the giveaway! Great list of favourites here, I’d love to try them out! Mabels Labels are a great item to personalize your back to school supplies. Thanks, these would be great for back to school. The Parkland backpacks look so user-friendly for our little one! School supplies are a great giveaway. Can’t wait to win all of these fabulous prizes just in time for back-to-school! I had never seen Hungry Buddha coconut chips. I’ll have to try them. This will definitely make Back to School easier for someone, good luck to everyone entering! Thanks for the chance! My two 6-year-olds start school in less than 2 weeks and I haven’t started shopping yet. This sure would come in handy. Thanks for hosting. Back to school is coming fast! Thanks for the opportunity! ! 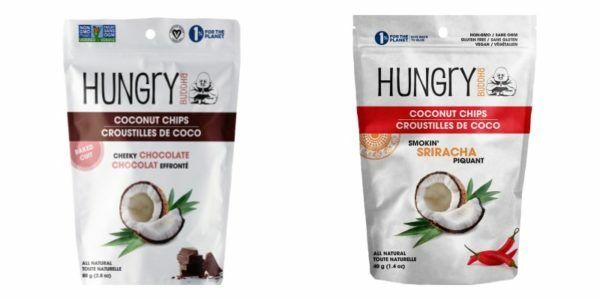 I would love to try the Hungry Buddha coconut chips. Thanks for the giveaway! 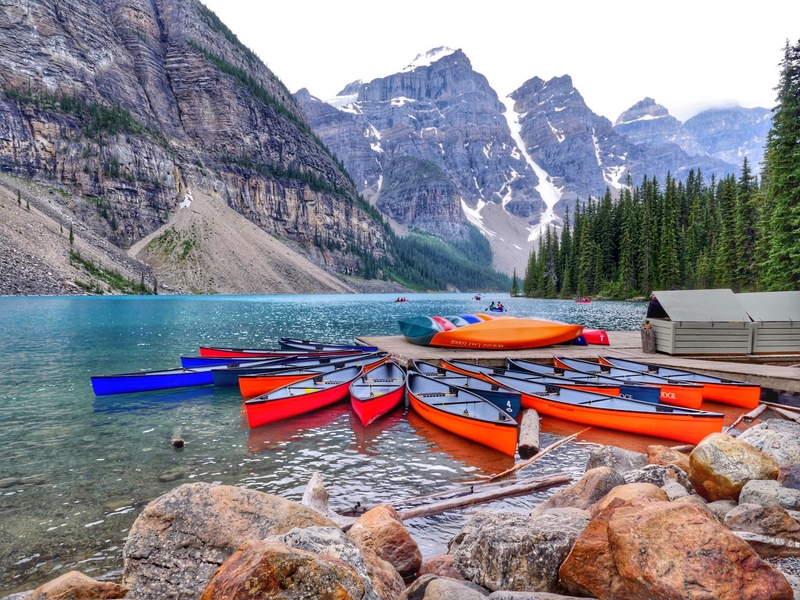 Makes me want to visit Toronto. Lots of fun there. When I saw the Mr. Sketch Markers it brought back memories. My girls loved their fruit scented markers. Now I see they are scented like movie foods. What a great prize pack! With both girls in school this would be awesome! Mm, I love coconut chips! What a great addition for a back to school item. I’m a bit sad that summer is coming to an end because I love being home with my kids, but school supply shopping and getting new things is always fun! Wow. ….that’s a lot of comments!!!!! Such great back to school products in this giveaway! Thanks so very much for the opportunity! This would be amazing! We ho through 3 backpacks every year. I bet these would hold up. The bento boxes have been on our wish list as the kids end up with mushed lunches 95% of the time. Would love to win this for my nephews!! Thanks for the chance to win such an awesome prize to help with back to school. Thanks for the giveaway, would definitely help out with Back to School! All great things for back to school. THIS IS AN INCREDIBLE PRIZE! Thank you (and the many sponsors) for the wonderful chance to win. Great products from great retailers! Was just at Staples today and got some great deals! love, love these bentos – so perfect for kiddo and I’d totally love everything in one spot for me too! This is a great and unique selection of items. Love all the products in this giveaway! Would love a gift card for Well.ca. Great Canadian company. Thanks you for the contest this will be a great win to help out some family,good luck to all ! There are so many useful things! Thanks for the opportunity! 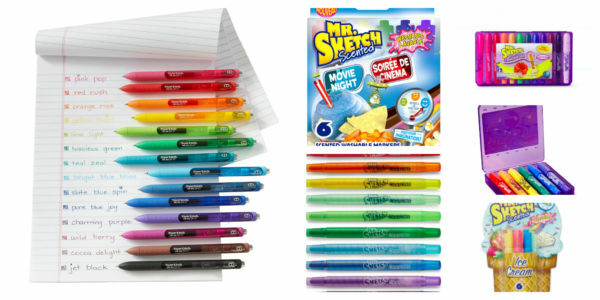 mmmmmm…yummy…who doesn’t love Mr Sketch smelly markers!!! Mabels Labels are on all my grandchildren’s belongings. They last through washes and I sure recommend them. This would be great for my daughter who’s a teacher, to start the school year. This year back to school is especially stressful because I am moving too! I could outfit them so well this year with this! This is an amazing prize pack. Thanks for the opportunity to win! The Monbento Takenaka Single Bento Box would be handy for packing lunches. The fact that it is BPA and lead free and you can put it in the dishwasher as well as the microwave really add to the benefits. 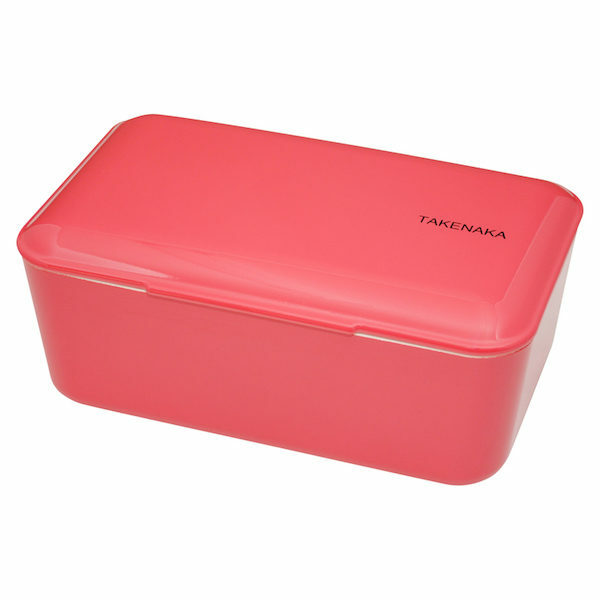 I like the Takenaka bento box – would be perfect for snacks. so much great stuff for back to school!!!! I’ve got my fingers and toes crossed!! Fingers crossed…this literally could make a world of difference for my family right now!! Thanks Solo Mom for this amazing chance to win it all!! Cherry Chocolate Coconut Chips sound like heaven!! Thanks so much for an amazing Back to School giveaway! Wow..This is such a good back-to-school package! nice healthy snacks too! Great prizes! This would be awesome to win! I like the brightly coloured Monbento Tresor boxes! Thanks for the great giveaway!! My kids could really use this!! Thanks for the chance! OMG……I would love to win the Best Beach adventure!! It looks awesome!! A great collection of different but really useful items. These are some of my favourite retailers as well. Absolutely incredible back to school giveaway! Thanks for the chance! It is almost time to find out who the winner is, good luck everyone!! What a great chance to win some awesome prizes. Great prizes! \would love to win! What a great prize pack! Thanks for the opportunity to win this. Staples is the perfect store for BTS shopping! Great variety for back to school. A Laptop is truly what my family could use the most! amazing prize thanks for the chance! the bento box looks really neat! Back-to-school bonus! Thanks Solo Mom! This is a great prize to start the school year off right. Lots of great items in this prize package. I hope I win this for my niece, I would have loved it when I was her age! The Mint Jawbreaker backpack is really nice and I like the big pocket on the outside. There are lots of great items in this prize package. Thanks for the chance! Would love to try all these awesome products. Some of our very favourite brands! Mabel’s labels, s’well, Mr. Sketch. Great contest and fingers crossed to win. I could ensure my grandkids are fully fitted for back to school. The bento boxes are a great find. I love this selection of products. this would make it the best BTS year ever! so, so happy to have found a bunch of these brands that are new to me! Thanks! Love this giveaway thanks for the chance! It would be wonderful to win this prize pack! Some great ideas here for BTS. Love the scented washable markers. 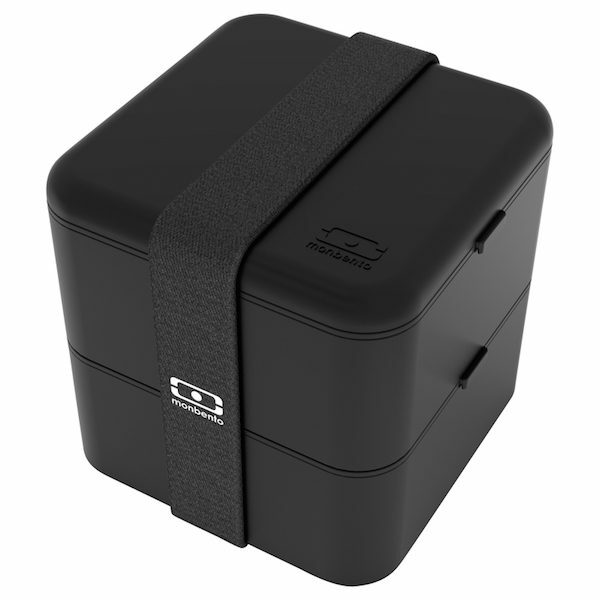 How stylish is that Monbento Square Bento Box? WOW! Love that it can be one or two levels! So many awesome back to school prizes here. Thanks for the giveaway! There are so many great products being given away here! IT’d be like Christmas! I would like to try the mixed berry granola minis. I would use this prize to purchase a laptop for a someone in my family. Those MadeGood Granola Bars are so tasty! I discovered them half way through the last school year too! Back to School can be an expensive time for parents – this prize pack would go a long way in helping our family get ready! Great giveaway with wonderful sponsors, thanks for the chance! This looks awesome, I hope I can win for my niece! Thanks for taking time doing this giveaway! The Parkland Bayside Backpacks are great! Thanks for the chance to win! Some of these are great ideas for donation drives too. The Buddah Coconut Chips look tasty and a must try for us. These are definitely good choices. I have never tried Made Good bars and granola minis.Hope I win so I can test them out 🙂 Thanks again for the great giveaway! I cant wait to find out who the lucky winner is..hope its ME!! Good luck! fingers and toes are crossed this would be an sweet win!! I am absolutely dreading the risk of lice at school – I have terrible memories of my own experience as a kid with super long hair 🙁 Glad this comb is included, as being prepared takes a bit of the anxiety out of it! This is an amazing giveaway! Thank you! I love to visit Chapters and spend some quality time there shopping with my kids. I would like to try the strawberry Made Good granola minis. Love all these Back to School items – so cool! Good luck to everyone! I have my fingers crossed! I want to win this. So awesome! Thank you for the great giveaway. This would be great to win. Can’t wait to hear that I’ve won this! Crossing my fingers!! Indigo has such cute things for back to school! My kids could really use this! !Good luck everyone ! I’ve never tried Coconut Chips but they sound interesting. That Staples gift card would come in handy for buying printer cartridges. They always have the ones we need in stock. This list of school supplies would take care of part of the back to school spending required to the kids a good start. Thanks again, good luck to everyone who has entered! There are so many great products in this giveaway! Thank you so much for the chance to win! I just noticed that there is a gift card from Staples!! that would be very helpful towards buying ink for the printer. thanks again for the great giveaway!! I could so much for the home office if i won this contest! This is an awesome giveaway. Thank you for the chance. This is an amazing prize. Thank you so much for the opportunity. Good luck to everyone! Good luck everyone!!! Fingers crossed that I am the luck y winner to this awesome giveaway!! Thanks again Solomom! Oh I see Larissa Won!! Congrats to you!! The Mr Sketch and Paper Mate Inkjoy would be great for my granddaughter who loves to sketch and draw.